Finding the best food for Weimaraners can be tough. What do you feed a dog that burns crazy, insane, bonkers amounts of calories? I mean, seriously, they’re like little food furnaces. And if you have a Weimaraner, it’s very likely that he’s an exercise partner or a working dog, which means he’s probably burning even more calories than a typical Weimaraner. Because they’re burning such nutty amounts of energy, they also have pretty specific dietary needs. We consulted with a few breeding experts and Weimaraner enthusiasts to figure out exactly what you should be feeding your pup. And, of course, we used our dog for our in-house taste testing. So check out the information below to develop a great diet plan for your feisty Weim. You’ll be pretty hard-pressed to find a dog that burns as many calories as a Weimaraner. Most of the time, it’s because your Weim is doing whatever it can to get as much exercise as it can. I know a Weim named Cooper, for example, who swims with (and out-swims) his owner on a daily basis. These guys love to run. They were bred for hunting by German royalty in the 19th century, and they were especially bread for endurance. So it’s not uncommon to see a Weimaraner comfortably running dozens of miles at a time. At an average of 70 pounds, they’re also big dogs. When you combine the two—large size and insane amounts of energy—you get a lean, mean, calorie-burning machine. Let’s take a second to figure out exactly how many calories your Weimaraner needs. Most dogs need an average of 30 calories per pound of bodyweight per day, and that’s still true for the rare, inactive Weim. Most Weimaraners, however, need about 35 calories per pound of bodyweight. This is for a typically active dog of average size. If, however, your Weim is a working dog or a running partner, he might need as much as much as 40 calories per pound of bodyweight. Because this breed needs so many calories, it’s usually best to space meals out throughout the day. Overfeeding any dog can cause both short- and long-term tummy troubles (and no one likes to find “messes” hidden around the house). 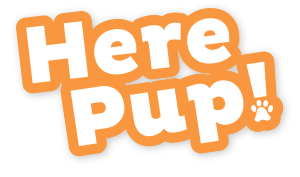 Of course, like any dog, you need to keep an eye on your puppy pal’s weight and adjust his diet according to whether you want him to gain weight, lose weight, or maintain his current weight. Since Weimaraners tend to get lots of exercise (or have dog jobs), they need plenty of protein and a few more complex carbohydrates (e.g. brown rice, sweet potatoes) than other dogs. The standard rule for protein applies to Weimaraners: try to find a dog food that consists of at least 25% protein. However, some Weimaraner enthusiasts told us they prefer to feed their dog a diet consisting of 50% meat or more. Hip dysplasia. Like other big, active dogs (e.g. Golden Retrievers), Weimaraners are prone to joint problems. In particular, this breed has hip problems, especially if they like to run. This isn’t something you care 100% treat, and you really can’t prevent it, either. However, you can manage it, and it’s relatively easy with a proper diet. Just look for foods high in (1) calcium, (2) glucosamine and (3) chondroitin, which helps keep cartilage healthy. Dry skin and coat. Weimaraners are also prone to dry skin and dry coats. To prevent this, make sure there’s adequate fat in your dog’s diet. It doesn’t have to omega-rich fat, but that’s ideal. You can also look for foods high in Vitamin E, which helps the skin retain and produce oil. Weimaraners don’t need as much fat as long-haired dogs, but they do need some to keep their skin healthy and to keep their coats from drying out; a diet with 5% of its calories coming from fat should be more than enough. Allergies. Some Weimaraners develop allergies, usually in adulthood. This might lead to rashes, hair loss or other skin problems. If your pup starts to show any of these symptoms, consult your vet and ask about removing grain from your dog’s diet, which is a relatively common solution. 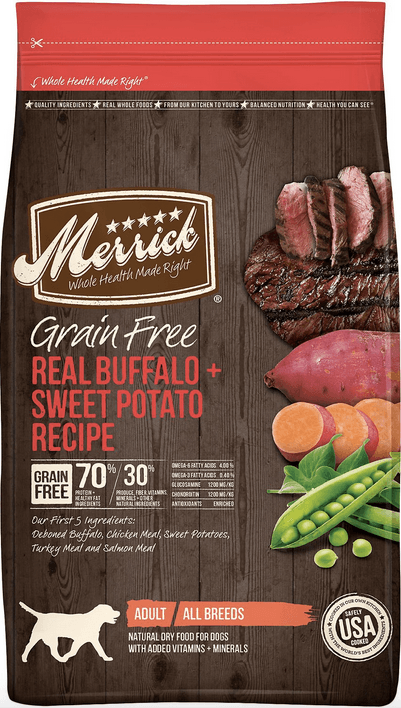 Merrick’s grain-free buffalo recipe is one of my favorites for big, active dogs who don’t necessarily need a ton of fat in their diet. The main ingredient is buffalo, which is a relatively lean mean compared to, say, beef or lamb. You don’t get as much fat, but it also makes it very nutrient-dense. The best thing about this formula by far though, is that it consists of 70% meat proteins (meat and meal, but no byproducts). That is a lot, and it’s pretty tough to find a commercial food with that much protein. Remember, a few Weim enthusiasts swear by a high-protein diet for this breed. There are no grains in here, either, so you can curb any allergies your pup might have right off the bat. The rest of the calories come from mostly from sweet potato, peas and salmon oil, which are excellent ingredients for a Weimaraner. This food ain’t cheap, but it’s by far the best choice (in our opinion anyway). If that wasn’t enough, our in-house taste tester thought it tasted amazing, so it gets our pup's seal of approval. 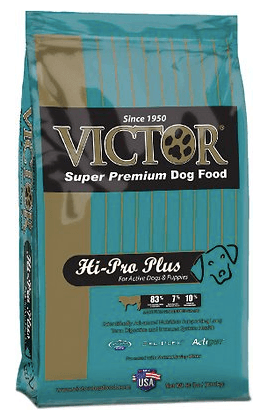 This dog food markets itself as a puppy formula, but it’s also great for super-active dogs (and your Weim is probably a super-active dog!). This formula gets it’s protein from three different meat sources—beef, chicken and pork—and, as a rule, it’s best to have a much variety as possible in a diet (yours or your dog’s!). It’s also grain-free, which is great for any dog prone to allergies. Instead, the carbohydrates come from sweet potatoes. Finally, there are plenty of veggies here: kelp, tomatoes, beets, celery, and a bunch more. I do wish there was a bit more fruit in here, but, hey, you can’t have it all! This is a tricky one to review, but hear me out. 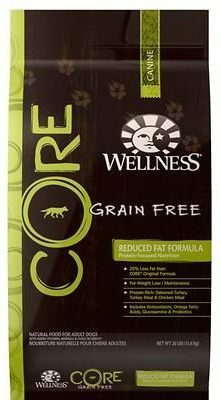 First, we love Wellness brand dog food. They just do a really good job. This particular formula, though, advertises itself as a “diet” recipe. This is mostly because it has less fat than most dog formulas. However, it’s packed with lots of very high quality ingredients, and Weimaraners don’t need tons of fat anyway. It also has lots of great proteins from lots of good sources, including deboned turkey, chicken meal and turkey meal. Finally, it does what every Wellness brand food does well: includes loads and loads of fruits and veggies and good, omega-rich fats. We find ourselves including this brand a lot in our reviews—mostly because their products are super-simple and very well-balanced, and this one is no exception. 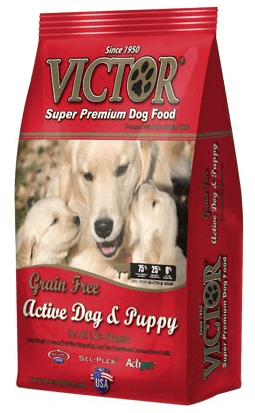 This is Victor brand’s puppy formula, and it’s also great for active dogs. It’s a bit more calorie- and nutrient-dense than their other formulas. It also has a lot of the same benefits: meat from lots of different sources, or gluten, and a few good fats. The protein here comes from beef, chicken and pork meals, and, as we’ve mentioned about a hundred times on this blog, we like variety however we can get it. That said, there are a few drawbacks with this recipe. First, there aren’t very many fruits and veggies. Also, the carbohydrates come from whole grain sorghum instead of something a little more natural, like a sweet potato. It works, but it’s less than ideal. Still, this is a good, high-protein option. I wanted to round out our list with a formula slightly higher in fat—just in case you have a dog with dry skin or a dry coat. 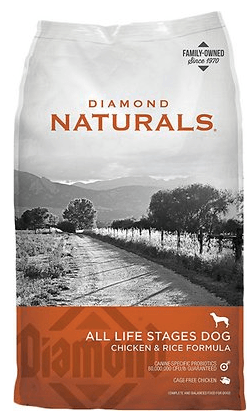 Diamond’s chicken and rice recipe for adult dogs contains about 16% fat, which is higher than the others on our list. That comes from both animal fat and fat supplements that provide plenty of omegas. There are also plenty of sources of antioxidants in here, which is never a bad thing. Like this guide? Hungry for more? Start with this guide on the best food options for Dobermans. If you dug that one, we also have some good info on good food choices for border collies. 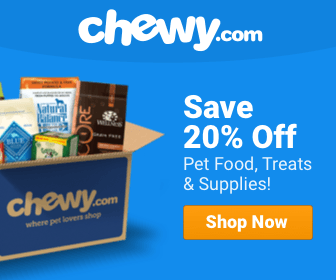 If your pup has tummy troubles, check out this post. And here's a good guide on low fat foods.